To commemorate National Fire Prevention Month that is observed every October, Teamsters Local 700 honored five of our brave firefighters for their heroic acts that saved the lives of others. The honorees included Matthew Gray, Kevin Hedman and Lt. Andrew Plonski from Prospect Heights Fire Protection District, and Lt. Eric Antrobus and Christopher Kamin from the Summit Fire Department. 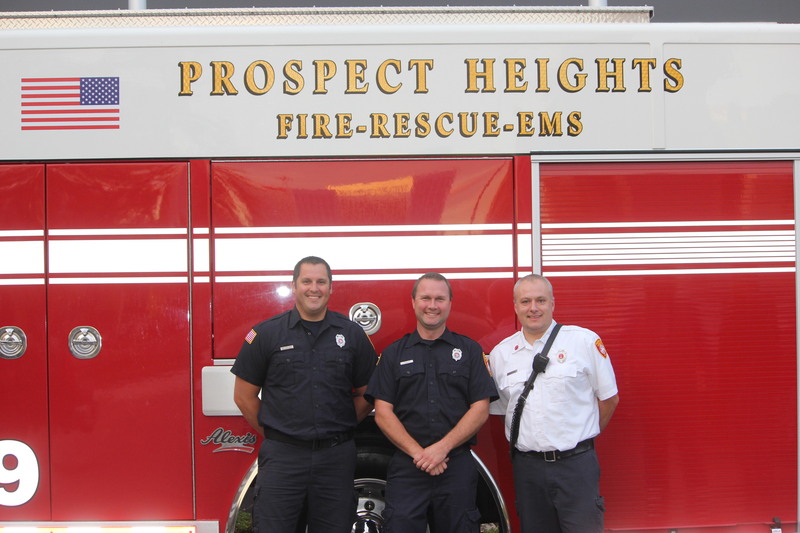 A team of paramedics from the Prospect Heights Fire Protection District was issued the first Company Citation award for their efforts in saving a man’s life earlier this year. Included on the team of paramedics were three members of Teamsters Local 700: Matthew Gray, Kevin Hedman and Lt. Andrew Plonski. Matthew Gray, Kevin Hedman and Lt. Andrew Plonski brought their fire truck to the general membership meeting on Oct. 13. In January of this year, 67-year-old Des Plaines resident Dale Nelson was visiting the Prospect Heights community when he suffered a serious cardiac emergency. His heart had stopped and he was no longer breathing. Responding paramedics arrived and immediately started advanced life support care and Nelson was quickly transported to Northwest Community Hospital in extremely critical condition. Luckily, due to the outstanding support and life-saving skills provided by the paramedics, Nelson fully recovered. In a previous interview, he recalled how doctors had talked to his family about his very low chance of survival, and told them to “prepare for the worst.” Nelson stopped by the March 17 Board of Trustees meeting to participate in honoring the team of paramedics that saved his life. This was the first Company Citation award given by the Fire District to honor the exemplary work of the Red Shift crew. Since its inception in 1944, the Prospect Heights fire protection unit was never previously unionized. The four-year agreement with Local 700 was retroactive to 2014 and will expire in December of 2018. Last April, Summit firefighters were called into action when a vacant two-story building nearby had caught on fire. Among the team of firefighters that arrived on the scene were Local 700 members Eric Antrobus and Chris Kamin. 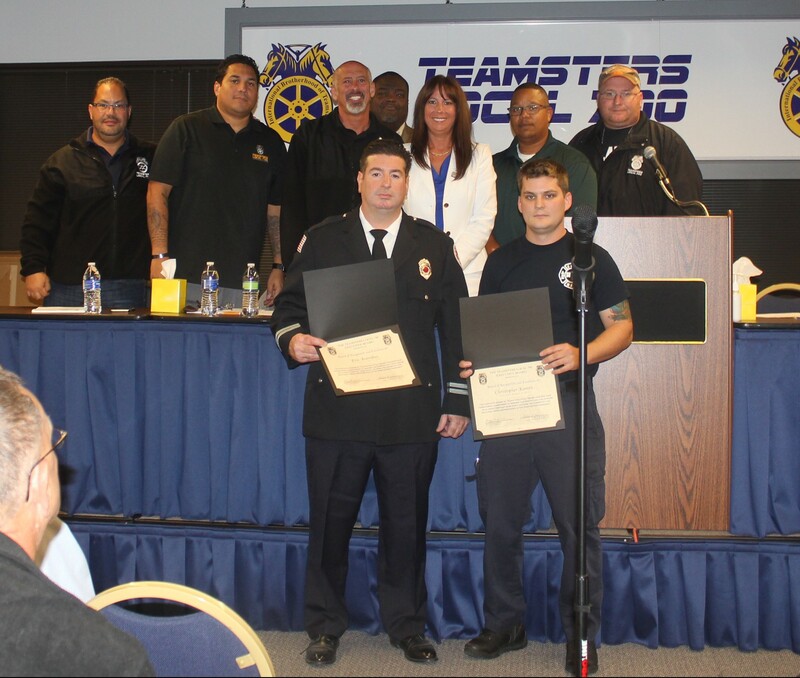 Lt. Eric Antrobus and Chris Kamin of the Summit Fire Department honored at the Local 700 general membership meeting on Oct. 13. While the building was engulfed in flames, one of their fellow firemen fell through the basement, and Antrobus immediately responded. He followed the hoseline to see where the fireman had fallen among all of the smoke and debris. Antrobus knew time was critical. If there was any delay in locating the firefighter, confusion and disorientation may cause him to leave his location to find another way out, and possibly deplete his air supply before a rescue could be made. After trying to lift the fireman out of the hole and being unsuccessful, Kamin came to assist Antrobus and with another two attempts, and nearly falling into the hole themselves, they were able to safely pull him out together. Teamsters Local 700 is proud to represent the Summit Fire Department and the full-time staff of the Prospect Heights Fire Protection District. Each year, the National Fire Protection Association designates the month of October as Fire Prevention Month, a cause that dates back to 1871 when The Great Chicago Fire killed more than 250 people and left more than 100,000 homeless. While our fire departments promote many aspects of fire safety throughout the month of October, the theme of this year’s Fire Prevention Week is “Hear the Beep Where you Sleep,” which focuses on keeping your family safe with a working smoke alarm in every bedroom. The National Fire Protection Association recommends installing smoke alarms in every bedroom, outside each separate sleeping area, and on every level of your home, including the basement. It is a small task that can make the difference between life and death. Nearly half of home fire deaths result from fires reported between 11 p.m. and 7 a.m., when most people are asleep. Smoke alarms save lives. We encourage everyone to utilize these important smoke alarm tips and visit the National Fire Protection Association website at nfpa.org to learn more about fire safety.